Obituary for Jeanette M. Wullenschneider | Drinkwine Family Mortuary, Inc.
Jeanette (Jan) was born in a farmhouse outside of Andale, Kansas. She was the seventh of eight children born to Nick and Regina Reichenberger; all preceded her in death. After high school Jeanette attended nursing school at St. Francis Hospital in Wichita. She joined the Army in 1944 and was stationed in Europe during WWII. She took care of both Allied and Axis soldiers and in an often-repeated story, actually learned of FDR's death from a German soldier. After VE Day, she was part of the Army of Occupation in Paris and Munich. She took care of concentration camp survivors and was appalled by Holocaust deniers. Jeanette married Joseph B. Wullenschneider, Jr. in 1950; they were married for 56 years until Joe died in 2006. Quite an achievement since she told people she wasn't impressed with Joe on first meeting him "because he thought he was God's gift to women!" Joe, Jeanette, and their three children moved to Littleton in 1960. 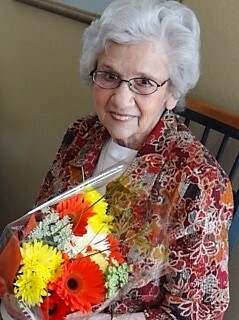 Jeanette worked part time at Swedish Hospital and Cherrelyn Manor Nursing Home until her retirement. Once retired from nursing, she spent her time volunteering as a Eucharistic Minister and Stephens Minister at St. Mary's, supporting the Carmelite Monastery nuns as their "Uber" driver, and being the very best Grandma any child could wish for. Jeanette was an excellent cook who made the best Christmas cookies ever, a devout Catholic, and a long-time fan of the Broncos and the Rockies (not necessarily in that order). She loved Colorado but remained a Kansas girl at heart; she and Joe went back frequently to visit family until health issues made travel difficult. Jeanette's later years were spent in independent living at Lakeview Senior Living (where she was active in their veterans group) and in hospice care at Belleview Suites DTC. The family is forever grateful for the loving care provided by Lutheran Hospice and Belleview Suites during the final weeks of Jeanette's life. Jeanette is survived by Deborah (Carl) Janicek, Katherine (Russell) Erganbright, JB (Gail) Wullenschneider, III, and eight grandchildren, four great-granddaughters, many loving nieces, nephews and other extended family, friends and neighbors. In lieu of flowers, please consider a donation to the Carmelite Monastery, 6138 South Gallup Street, Littleton CO 80120. Recitation of Rosary 7:00 PM Monday - March 4, 2018 at Drinkwine Chapel. Funeral Mass Tuesday - March 5, 2019 at 10:30 AM at St. Mary Catholic Church with reception to follow. Burial with full military honors will be at Ft. Logan National Cemetery.